When I was little my local library used to have puppets that you could check out for two weeks. There was a baby seal and a shark puppet (I think those were the two!) that I was absolutely in love with. (I'm going to try not to think about how many other young children cuddled with those stuffed puppets but just enjoy the memory of them.) At any rate, I was rather overjoyed to see Mary Meyer's Shark Puppet. The coolest thing is the shark mouth that is zippered shut (the zipper gives the look of sharp shark teeth) which when opened produces little finger puppets inside. You'll find a little sea horse, a starfish and an angel fish. 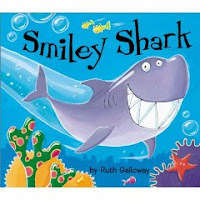 Which brings me to my read aloud book of the week: Smiley Shark, by Ruth Galloway . I first reviewed the Fidgety Fish series over at 5 Minutes for Books. I love this series both for the illustrations (bold and bright) and for the stories themselves. In the story of Smiley Shark , Smiley is sad because none of the other sea animals appear to like him. He tries to be friendly and approaches all of the animals with a big, wide grin. The problem, as you can imagine, is that whenever he bears his toothy grin, the other animals suspect the worst and run away from him. As we've been reading along with this story, we've made our starfish twirl away, we've made our own "smiley shark" dip and dive and swim around the living room and we've had a great time doing it. I wish I had a video of my son playing with this shark puppet while reading about Smiley . We've used the shark puppet and the book to identify parts of the shark's body. We've talked about the various ocean animals and have used the finger puppet of the sea horse to show how they swim and use their tails to hold onto seaweed and other ocean "fixtures." This is just a great set that we're really pleased with. The entire book is told in rhyme and through it you learn about driftwood, flocks of seagulls (and their bad scavenging habits! ), whales, rain and good sea tales. This is a rather unique picture book with intriguing illustrations by Greta Guzek. There are no straight lines in her illustrations making the whole book feel like a rhythmic tale with waves lapping up on the shore. That's really the best way I can think of to explain it. It all just rocks and flows together. Of course, we're big sea creature fans around here mostly because of Disney's Finding Nemo . Nemo has opened up an entire underwater world of adventure and fun. I don't mind learning about sea animals and much prefer this over insects, let me tell ya! Mommy doesn't like bugs but she'll do fish! So it's fun. And the fun continues. Have any of you used puppets in your story telling or considered it? About when did you start (if you have) doing puppet shows with your kids? I'd love to hear your stories of things you've tried and done if you are willing to share! I do storytimes with K-3 at the library where I work, and I haven't used puppets with them but I'd love to try! :-) I like the books you're reading- they look awesome! Also thanks for stopping by my blog & for your nice words! :-) it's nice to meet you! I'll add you to my update feed & come back! Our library has a puppet theatre and lots and LOTS of puppets. The kids love them! I do not use puppets with storytelling, but Kyle sure likes to play with them. It rumbled and grumbled, it turned and it tumbled. It fluttered and groaned and mumbled and moaned. I still know fidgety fish off by heart and i haven't read it for 3 years. My daughter used to love it. I've never used puppets though. Sounds like a good idea though. 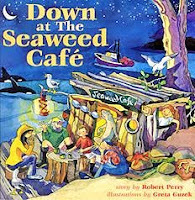 Oooh, Down at the Seaweed Cafe looks like lots of fun. I LOVE rhyming books. We haven't played much with puppets, although we have had some. Maybe we need to give them a try again. I hadn't really thought of it before you mentioned it, but my three year old son would LOVE a little puppet show to go along with his favourite books! I think I will have to look for some now..